Layal Ghanem has compared photographs of herself from before and after the war came to her home in Beirut. “There is something missing there,” she used to think, looking at pictures of the child she became in the 1980s during Lebanon’s civil war. The sound of “constant bombings” outside her house left her with intense social anxiety and a fear of bright lights and loud noises for years: a car’s headlights shining in her driveway was enough to make her cry out in the night. Ghanem graduated from school and began working as an actor, but said she did not feel like she could cope with her trauma until three years ago, when she discovered an unexpected passion for clowning. “I gave the child in me the freedom she was always looking for,” she said. 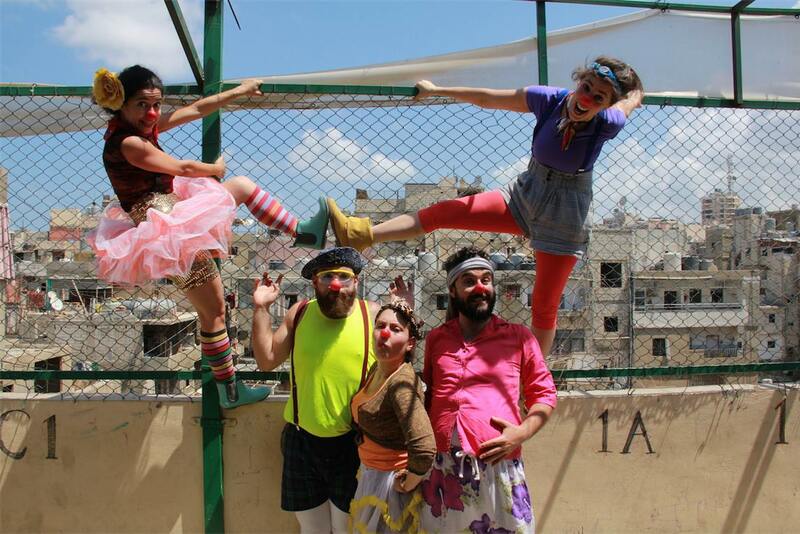 Now, she is a member of Clown Me In, a Beirut-based clowning group that performs for young Syrian refugees: the children of a new generation of war. In the five years since the Syrian revolution became a multi-faction war, 2.4 million children have become refugees, according to the United Nations. Another 306,000 children have been born as refugees in the past four years. Many of these children now live in Lebanon, where more than a quarter of the country’s current population recently migrated from Syria. Now, their story is intersecting with a centuries-old tradition of clowning. Clowns appear in historical records as far back as ancient Egypt and ancientimperial China, developed further in the tradition of commedia dell’arte in Italy, showed up in medieval Europe as jesters and drew attention in the 18th century in Britain as pantomime became popular. But the “the first recognizable ancestor of the modern clown,” according to the Smithsonian, came with Grimaldi, an English clown born in 1778 who brought together a combination of physical comedy, absurd costumes and white makeup for audiences of thousands. Clowns have long drawn on a sense of grotesqueness for their performances; as far back as 1876, French literary critic Edmond de Goncourt wrote that clown performances were “terrifying and full of anxiety and apprehension.” But the cliche of the “scary clown” as it appears in the popular imagination — their face pancaked with white makeup and wearing a cartoonish grimace — arose relatively recently in the history of clown, and cemented with the crimes of John Wayne Gacy, a clown performer who killed 35 young men in the 1970s. But Clown Me In eschews the heavy makeup that many Americans associate with clowns and performs with an emphasis on movement, mime and audience participation. 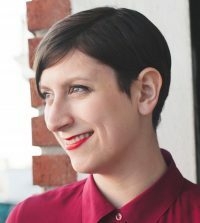 Sabine Choucair, the founder of the group, began clowning in 2006 shortly after she graduated from the London International School of Performing Arts. “I was like, ‘Wow, this is a magical thing that I would want to do for the rest of my life. I don’t want to do anything else,’” she said. She started trying to hold clowning performances and workshops in Lebanon, but at first it “totally failed, because people just thought that I was weird,” she said. 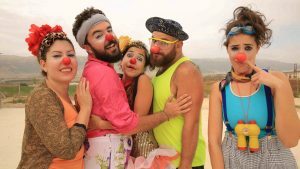 But in 2008, Choucair and her friend Gabriela Muñoz formed Clown Me In, a clowning group that began more and more to focus on social issues in Lebanon. One of their projects in 2014 raised awareness about traffic safety by clowning around cars at busy intersections, she said. Choucair calls these guerrilla performances “clown attacks.” And at that point, she knew where she wanted to bring them next: refugee camps. In 2016, Choucair traveled to Germany to perform with Clowns Without Borders, a nonprofit clowning group, at Berlin Tempelhof Airport, an airport built in 1927 that stopped operating in 2008. Tempelhof’s massive hangars now host thousands of Syrian refugees who have fled war in their home country. But as they wait, a common feeling of hopelessness pervades the camp, Choucair said. When she arrived there in the spring of 2015, some of the refugees told her that there had been five suicide attempts the previous week. “There’s this common feeling of boredom and no hope,” Choucair said. But then, they began the performance. One of the clowns began playing the accordion, leading the other performers down a long hallway. Choucair followed, blowing bubbles to every corner of the space. And as they danced through the airport, more and more people joined in — fathers holding their babies in the air, children who reached to pop the bubbles, a boy who told them it was his birthday. “He thought this was a very special day because at least there was something different. There was music, there was joy, there was laughter in the space,” Choucair said. The rest of Clown Me In joined her when she came back to Lebanon for a tour of performances, many of them at schools and refugee camps in the Bekaa Valley, where more than 360,000 Syrian refugees are living. Not all of the children who attend those performances are Syrian — a number of Palestinians, for example, have settled in the Shatila refugee camp, where the group has held shows. Clown Me In doesn’t focus on the kids’ home country, only that they want to laugh, Choucair said. There is no typical performance in the Bekaa Valley, only the assurance that it will begin with two cars full of clowns. 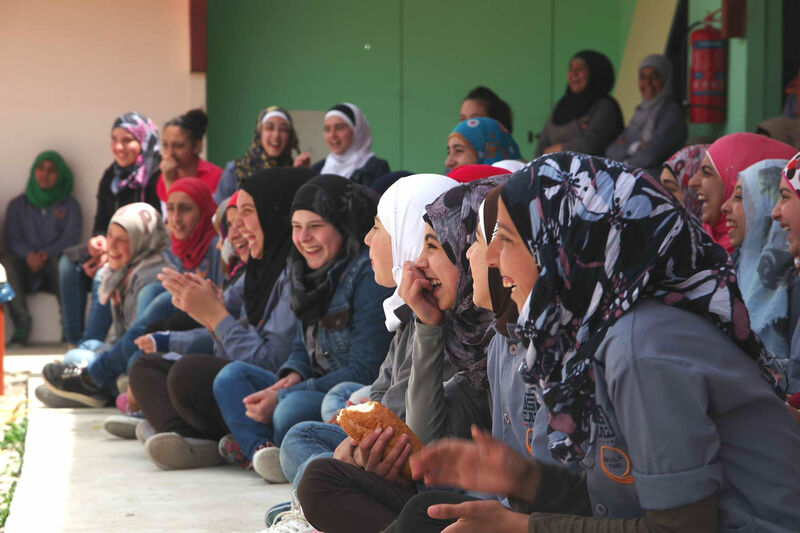 For another performance, Clown Me In arrived at the Malala Yousafzai All-Girls School in the Bekaa Valley, a school that serves Syrian refugees, only to find out that they were older than the group expected — most were 15 to 19 years old. “We were like, ‘Whoa! I wonder how this is gonna be,’” Choucair said, laughing. But Ghanem said that during the performance, she couldn’t help but think of how truncated their childhoods may have been. As the Syrian war continues, conditions have become increasingly difficult for child refugees, millions of whom have been deprived of attending school. 2.1 million children in Syria, and 700,000 Syrian refugee children, are not in school. This issue plays out in the audiences for Clown Me In shows, some of whom were very difficult to manage on this year’s tour, according to Choucair. In the absence of school, she said many of the children found it difficult to sit still and focus — particularly at one performance. But usually, once Clown Me In begins inviting kids onstage, they all want to be a part of it, Choucair said. That’s a method of performance that can help build community and taps into a long tradition of theatrical clowning, according to Christopher Scheer, who has taught clowning and worked as a clown for nearly a decade. Theatrical clowning often lacks any semblance of the invisible “fourth wall” that usually divides the audience and performer, leaving the relationship between them open to possibility: clowns may ask the audience to participate in a call and response, or bring one or several people into the show. Choucair said she can feel this sense of community in audiences no matter where she’s performing. “This is what’s important about clowning: it doesn’t matter where you are, what you’re going through. We all laugh together,” Choucair said. Video edited by Omar Etman.